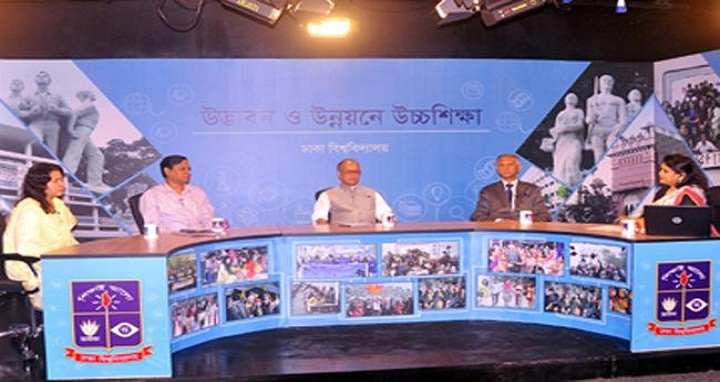 DU, July 18, Abnews: Dhaka University (DU) on Tuesday inaugurated a television studio at the 6th floor of Social Science Building on the campus. This is the first of its kind at any public university of bangladesh. Under the initiative of Television, Film and Photography Department of the university, World Bank (WB) and University Grants Commission (UGC) financed to set up the studio, said a press release. DU Vice-Chancellor Professor AAMS Arefin Siddique formally inaugurated the studio at a function at Professor Muzaffar Ahmed Chowdhury auditorium at the Social Science Building. UGC Chairman Professor Abdul Mannan attended the function as the chief guest with Social Sciences Faculty Acting Dean and Founding Chairman of Television, Film and Photography Department Professor AJM Shafiul Alam Bhuiyan in the chair. Describing television as a very strong media, Arefin Siddique expressed his hope that the studio would play an important role to produce skilled and trained manpower for the television and film industry. He underscored the need for achieving the mass media literacy to stop the misuse of television and film. The TV studio consists of panel control rooms, master control room, make up room, camera, lights and other studio equipments. Although the studio will be maintained by the Television, Film and Photography department, other students of the university can also participate in the TV. 'Dhaka University authority is always striving to provide practice-based education to the students of mass communication,' the VC said. Prof Mannan called upon the media to contribute to the positive change of the society. The studio has been set up with the cost of Taka 3 crore. The studio will run different programme through internet. AJM Shafiul Alam Bhuiyan also announced to open a campus based television channel named 'DU TV'.